When "Snowmaggedon" hit the Toledo area, most people headed to the grocery store to stock up and maybe to Home Depot for a shovel -- not your Toledo Wines and Vines tasting team. We had been planning to go to the Sonoma County Pinot Noir tasting at Aficionado with Sax Man and Wine Chick, but the snow began falling in earnest. A brisk wind made the flakes shoot across horizontally. Luckily for our readers, neither snow, nor wind, nor common sense could deter us from the wine tasting -- in fact we also decided to go to the Cork's tasting of blended wines as well. Aficionado was crowded. Apparently being surrounded by wine and friends is a fun way to flaunt the advice of "Blizzard" Bill Spencer, the Channel 13 weatherman. We opened with the 2007 MacMurray Ranch Sonoma Coast Pinor Noir. This is a classic Pinot with rich aromas of red fruit, but it seemed like it could use a bit more time in the bottle. Certainly a nice wine, but our least favorite of the evening. The 2007 Taft Street Sonoma Coast Pinot Noir was a popular pick, not only with our gang, but other tasters as well. This is very reasonably priced at $19.99. It has a big bouquet with a woodsy flavor. I've noticed Taft Street featured at some top restaurants across the country and now I know why. This is also a great QPR (Quality Price Ratio). The 2007 Schug Sonoma Coast Pinor Noir is a delicate Pinot that is steel fermented. It has cherry and spice in the mouth. This is well balanced and a great wine. The grand finale was the 2006 Scherrer Sonoma County Pinot Noir. This is priced at $39.99 and is on a different plateau than the other Pinots. Only 360 cases of this gem were produced. Upon swirling and enjoying the wine visually, great "legs" were evident. These little runners down the inside of the glass are taken by some to be a mark of quality for red wine, although I understand it has mostly to do with the alcohol content. This is a harmonious wine with a cola and lightly toasted oak taste. It has a central fruit element as well. In short, this was the crown prince of the evening, with Taft Street coming in a close second. Outside the storm was getting worse, so we did the logical thing and headed for Corks. 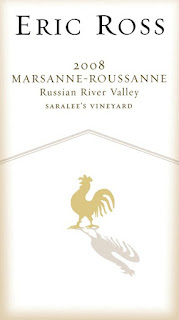 Featured for this evening were wine blends and we started with a 2008 Eric Ross Marsanne-Roussanne from the Russian River Valley in California. This is a rich, North Rhone style blend. It is light straw in color with a rustic flavor. Our next glass was the Chateau Virgile 2007Costieres de Nimes Rouge. This red is a blend of Syrah, Grenache and Mourvedre. This is a tasty wine with staying power. Next up was the Newton 2005 Napa Valley Claret. Claret is an old English term applied to red Bordeaux blends. This is a wine that is casual yet sophisticated. It is a blend of Cabernet Sauvignon, Merlot, Cabernet Franc, Petit Verdot and Syrah. It has flavors of black cherry and blackberries. This was the most enjoyable wine of the evening at Corks. It costs about $17. Rounding out the evening was D'Arenberg The Laughing Magpie 2006, a Shiraz Viognier blend from Australia. The vineyards and bushlands around the D'Arenberg winery are full of the the unique native Australian bird, the Kookaburra, famous for its distinctive laughing call. Two daughters of the winemaker began calling the birds "the laughing magpies" and the name stuck -- to the birds as well as the wine. This wine has a rich fruit aroma and a lush mouthfilling flavor of cranberries, blueberries and cherries. The 2006 vintage is said to be one of the best for this wine. D'Arenberg also makes the well-known "The Stump Jump" wines and the high end "The Dead Arm" Shiraz. The Laughing Magie was nice, but a tad too fruit-driven for my liking. I always stay open for Dave N! So glad you guys could make it.